The Iridium South America Plan offers a lower start-up cost for individuals and organizations who need satellite communications in South America. IMPORTANT! The South America prepaid plan has been discontinued. 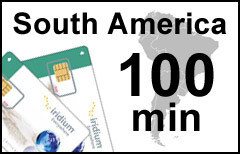 Please consider the Iridium Latin America 200-min plan instead.